Adjustable Ab Bench by York Barbell at Strongman Pictures. MPN: 4239. Hurry! Limited time offer. Offer valid only while supplies last. 4239 Features: -Comes with 205 FI bench plus 202 leg curl attachment. -Steel frame. -Vinyl upholstery. 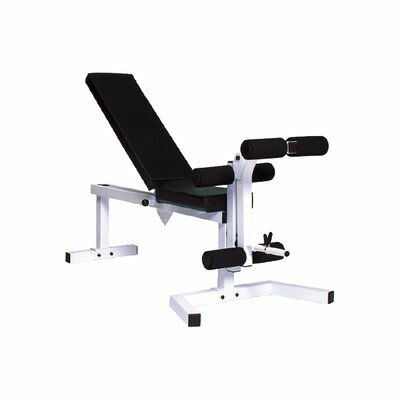 Product Type: -Ab bench. Frame Color: -White. 4239 Features: -Comes with 205 FI bench plus 202 leg curl attachment. -Steel frame. -Vinyl upholstery. Product Type: -Ab bench. Frame Color: -White. Upholstery Color: -Black. Frame Material: -Steel. Upholstery Material: -Vinyl. Dimensions: Overall Height - Top to Bottom: -19". Overall Width - Side to Side: -11". Overall Length - Front to Back: -45". Overall Product Weight: -58 lbs.